The School Initiative: Education is one of the primary building blocks of the steps to elevate poverty. 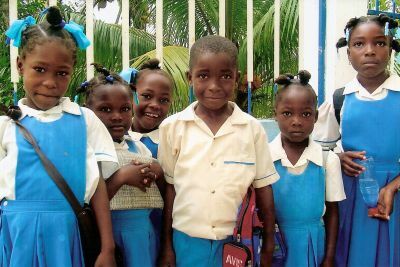 The Haiti School Initiative seeks to empower the children of Latiboliere by improving their education. We provide needed school supplies and financial assistance. For eight months of the year students walk, some times for 45 minutes or more, in the heat and possibly rain, to sit in very basic, hot classrooms. Computers? Smartboards? No. There is no electricity. Chalk is scarce and the teacher must write out a separate worksheet for each child. About 80% of all Haitians are illiterate. Only a little over half of primary school-age children are enrolled in school. Less than 2% of children finish secondary school. 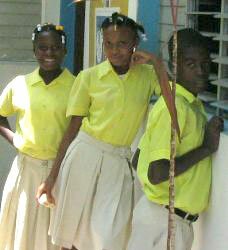 Those children fortunate enough to attend school in Latiboliere receive one hot meal a day. This is usually the only meal they eat that day. The school is very simple so only basic supplies are needed. A contribution of any amount is always welcome. Teachers are paid for 8 months a year. The recommended amount for Catholic Teachers in Haiti is about $75 a month or $600 a year. Place yourselves at the service of the poor. The poor do not need our compassion or our pity; they need our help.